SEATTLE--(BUSINESS WIRE)--Feb. 6, 2019-- (NASDAQ: AMZN) — Amazon Crossing, the literature in translation imprint of Amazon Publishing, announced today the acquisition of The Man Who Played with Fire: Stieg Larsson's Lost Files and the Hunt for an Assassin by Jan Stocklassa, translated by Tara F. Chace for publication on October 1, 2019. Ten years after The Girl with the Dragon Tattoo author Stieg Larsson’s death, journalist Jan Stocklassa gained exclusive access to Larsson’s private archive, uncovering Larsson’s unknown project—research and investigation into the unsolved assassination of Swedish Prime Minister Olof Palme. Stocklassa picks up on Larsson’s extensive research and quest to solve one of the most enigmatic murder mysteries in European history. Amazon Crossing Senior Editor Elizabeth DeNoma acquired global English rights from Judith Toth at The Nordin Agency. On February 28, 1986, Swedish Prime Minister Olof Palme was shot dead on the streets of Stockholm and the crime is still unsolved today. Before authoring his international best-selling Millennium Trilogy, Stieg Larsson began his own intense investigation into the assassination. He continued his search for the murderer for years—until his own death in 2004. In 2014, the journalist and documentary filmmaker Jan Stocklassa gained access to Larsson’s files through Larsson’s former employer, the anti-fascist magazine Expo, and discovered his private investigation into the Olof Palme homicide case in twenty cardboard boxes. 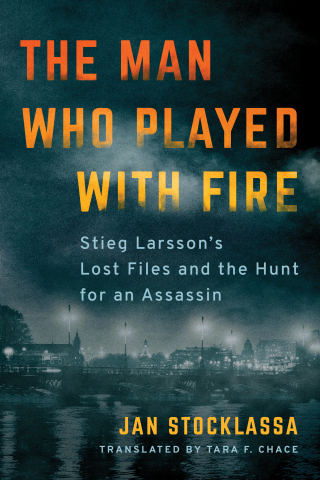 In The Man Who Played with Fire: Stieg Larsson and the Hunt for an Assassin, Stocklassa reveals new facts about the case and reveals the hitherto unknown research of the best-selling author in a fascinating true crime story. For the first time in many years, the police in Sweden have taken active measures to investigate a new suspect in the murder case and are pursuing leads based on the research revealed in Stocklassa’s book. Published originally in Swedish in November 2018, Jan Stocklassa’s book has now been published in Dutch, Finnish, Danish, German, Polish, Norwegian, French, and Estonian with another 16 languages to follow. Jan Stocklassa is also executive producer of a documentary film focusing on Larsson’s research into extreme right-wing groups. The documentary, titled The Man Who Played with Fire, premiered internationally at the Sundance Film Festival in January 2019. Amazon Publishing is a leading publisher of trade fiction, nonfiction, and children’s books with a mission to empower outstanding storytellers and connect them with readers worldwide. The Amazon Publishing teams based in Seattle, New York, Grand Haven, Luxembourg, London, Paris, Madrid, Milan and Munich publish emerging, bestselling and critically-acclaimed authors in digital, print and audio formats. For more information, visit apub.com.